Kohaku are among the best-loved of the many varieties of Jananese koi. “Kohaku” means both “red and white” as well as “bright feelings.” This Kohaku has a lovely “Kanoko” or “fawn” pattern which accentuates its vibrant, powerful colors. 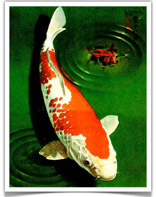 Elegant design elements accentuate the fish’s beauty: a complementary red and green color scheme, interlocking circles, diagonal composition, and the Oriental formality of the maple leaf. This extremely attractive print is like a Japanese flower arrangement. While the fish is very beautiful, it is not an unrealistically perfect specimen. Its imperfections counter the structure of the setting, and its tiny flaws emphasize its overall loveliness and give balance to the whole.